I picked up my dress about two weeks ago. My fiance has two extra closets with basically no clothing in them. I chose the taller closet, hung my plastic enclosed dress in it, and shut the stiff-hinged accordion-style doors. My fiance has a cat. Somehow she managed to get the door open and pee on the dress. I don’t have a clue how she got the door open. It’s difficult for me to open. Most of the pee was caught by the plastic bag, but some of it seeped through. There were only a couple of spots of yellow, but the dress reeked of cat pee. I spent all of Monday evening trying to get the smell and yellow out. I did both successfully. Yay! 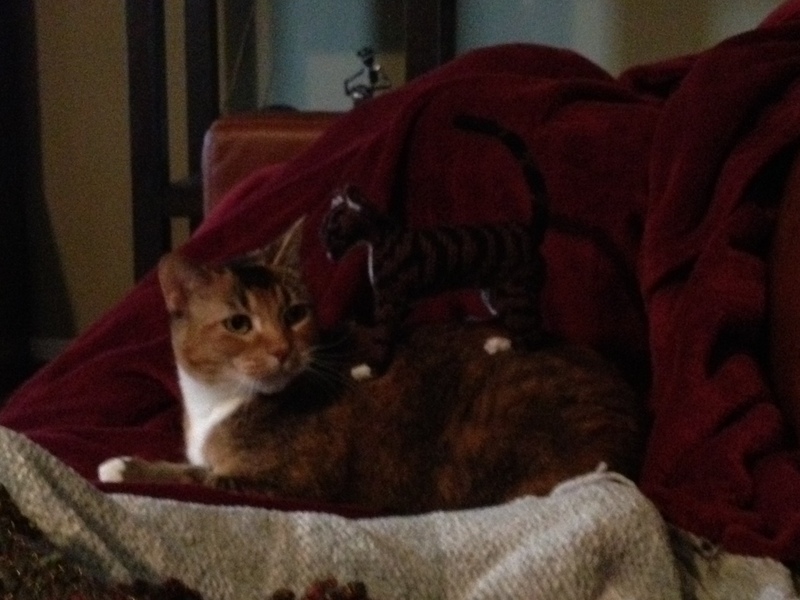 Needless to say, the cat is in trouble. I didn’t finish the sweater until Tuesday night. I wore it to work today (Wednesday). It turned out really cute! My colleagues couldn’t believe that I actually made it. 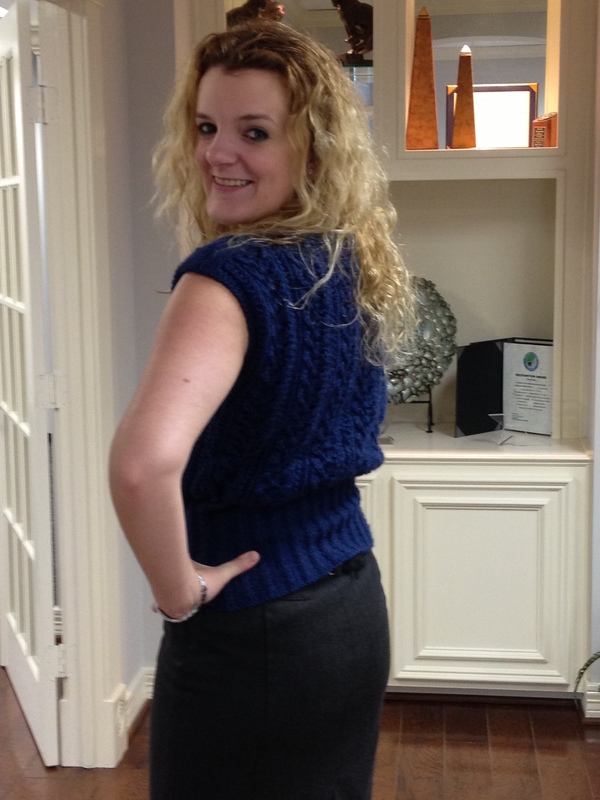 The pattern can be purchased at Holla Knits (the store/blog that hosted the knit-a-long). Usually I post tips and hints for things that I make, but I basically made this pattern as written. I lot of other people were making this sweater at the same time, so they posted tips about what they were doing. You may find these resources helpful. A lot of people ran out of yarn because the quantities in the pattern were a little off. 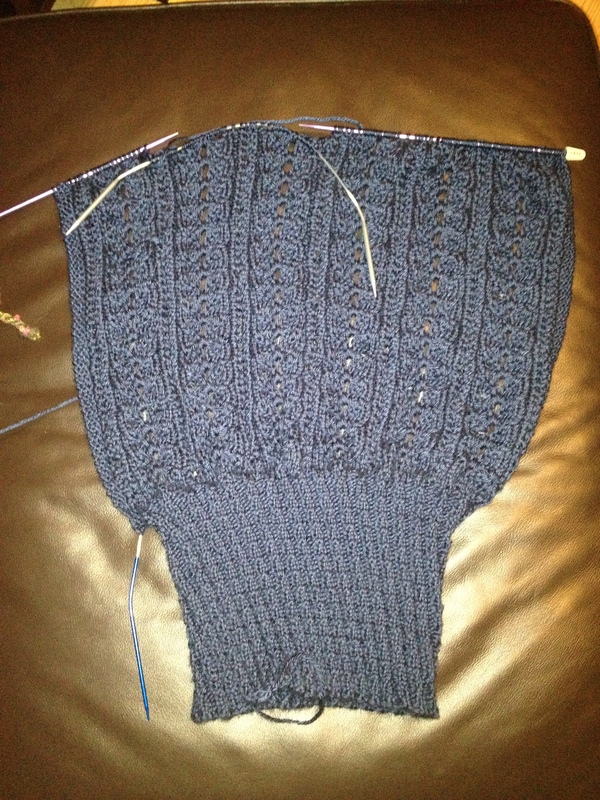 I think that the pattern has been remedied, but I’m not sure. The lace was difficult if you have never knitted lace before. 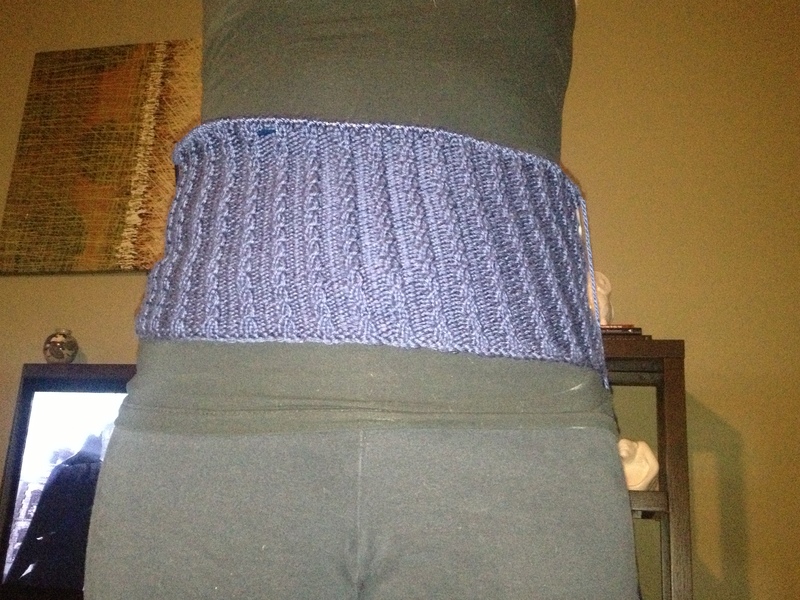 This was really fun to knit, and I love how it turned out! 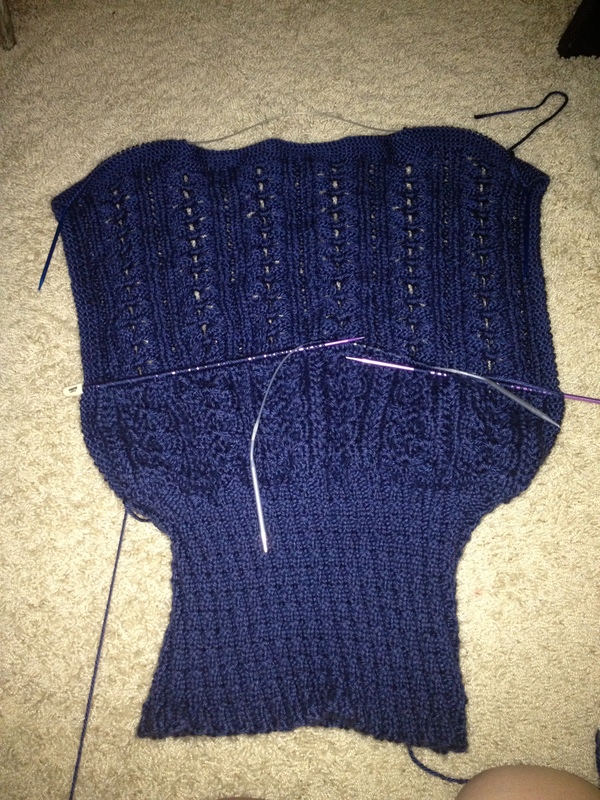 Well… I should have had the sweater finished by today, but we were all graciously given another week. I’ve knit 5/16 of the back lace repeats in the last two days. Hopefully I can finish by next Sunday! I love how it is turning out. I have been furiously finishing my dissertation this week, which resulted in no knitting from Sunday through Thursday. I finally finished the front of my summer sweater this morning, almost two weeks late. I’m really pleased with the way that it looks. I wanted to post a quick picture of it pinned to my form. Now I need to address those wedding invitations. I picked up my wedding dress this morning. Exciting! 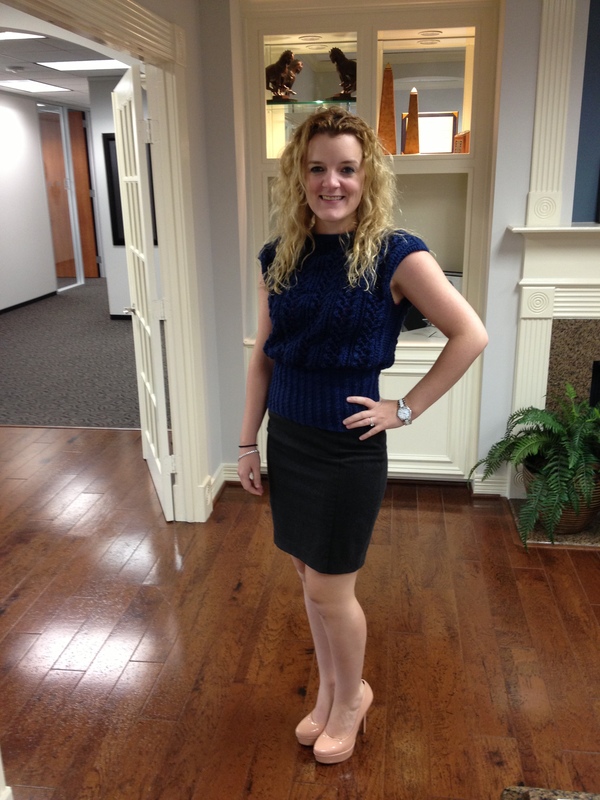 Only 85 days until I walk down the aisle! So… I’m pretty much behind on everything. I’m behind on my dissertation writing goal. The wedding invitations should have gone out on July 5 and won’t be going out until after I get my dissertation done. 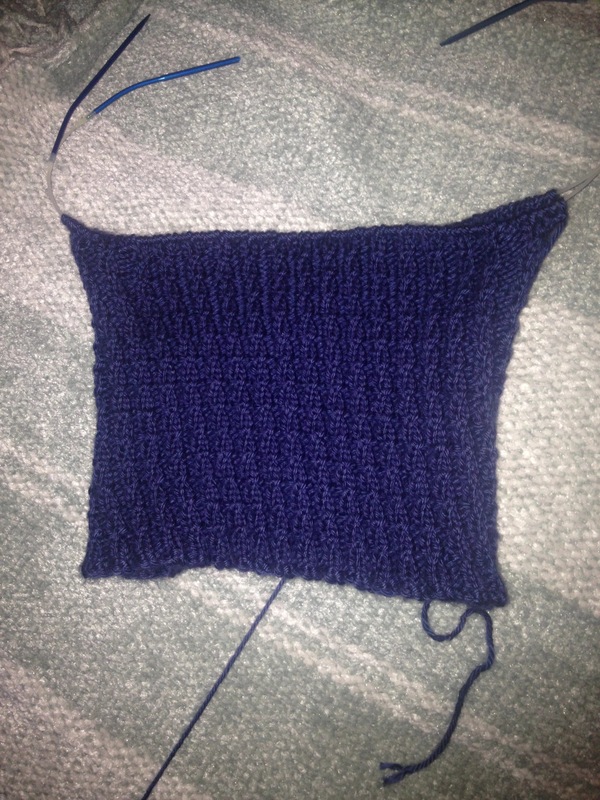 I’m way behind on my summer knit-a-long project. 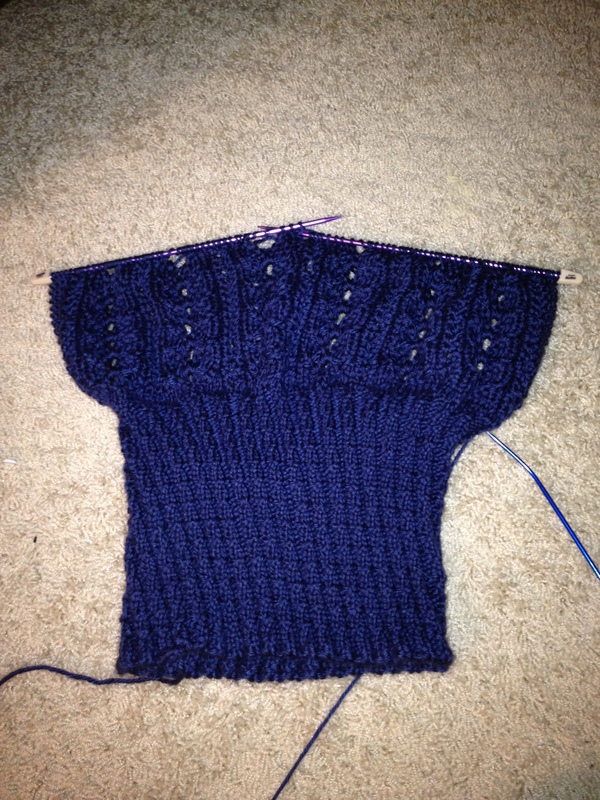 At this point I should have 16 lace repeats finished for the front of the sweater and 8 on the back. I have 15 total. The good news is that Katie and Allison, who are in charge of the knit-a-long, have decided to give us an extra week to finish. That should be perfect. I’m almost exactly one week behind at this point. See my progress below. I am way behind on this project. I’m currently finishing up my PhD and things have been crazy the last two weeks. I haven’t had much time to knit. I have 9 of the 16 lace repeats I was supposed to have done finished. Hopefully I have time to start catching up this week! This is what the finished product should look like. This week was crazy busy, and I had very little time to knit. I did not make my goal which was eight of the lace repeats. I managed 5.5 of them. Here is a quick progress picture. I’m looking forward to catching up on sleep tonight! 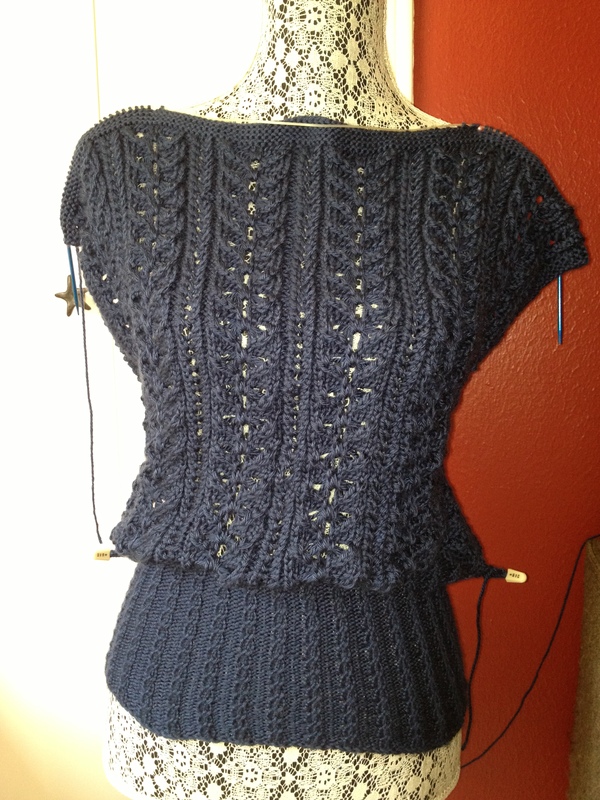 I finished Week 2 of the Nachtfalter Summer Knit-a-Long. 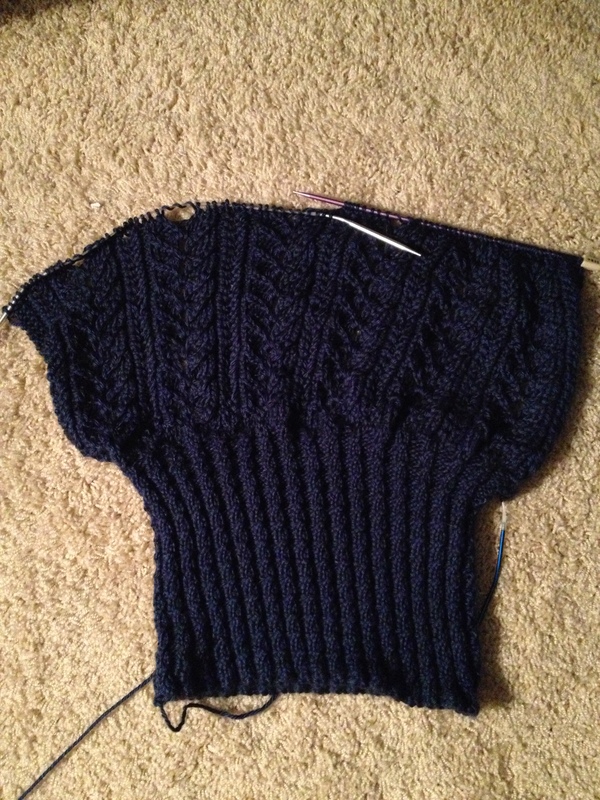 The goal this week was to finish the bottom ribbing. It fits like a charm!